Seven Days in May (1964) was director John Frankenheimer's follow-up to The Manchurian Candidate (1962), meant to be another unsettling portrait of power and politics. Given today's political climate though, it is striking how relatively sane everyone seems in this story of an attempted military takeover of the US government. While there are dark forces in the mix, for the most part the players here are intellectual, sober-minded and determined to act with honor. It feels like a fantasy. Now available on Blu-ray from Warner Archive, this engrossing, underseen film is a fascinating comment on its own times and a timeless story of the eternal truth that everyone thinks they are the good guy. Fredric March is embattled U.S. President Jordan Lyman, an increasingly unpopular leader who is under fire for signing a nuclear disarmament treaty with the Soviet Union in the midst of the cold war. In fear for the safety of the nation, Air Force General James Mattoon Scott (Burt Lancaster) has been working undercover to overthrow the president and create a government which satisfies his concept of defense. When Colonel Martin "Jiggs" Casey learns of the imminent takeover, he rushes to inform the president and preserve the union. What follows is a muted, but intense race to thwart the uprising in the seven days before it is to begin. Jiggs struggles to find his way through the conflict, a situation in which he does not agree with the actions of his president, but is determined to uphold the constitution. He is unsettled by the wrong he must do to protect his leader, and particularly that he must betray Scott's former mistress, and his friend, Eleanor Holbrook (Ava Gardner) to obtain potential ammunition. I don't know how much Rod Serling's script draws from the Fletcher Knebel and Charles Bailey II book, but it bears his mark: a plea for reason, belief in honor, but little faith that humans can act in their own best interest. While the film makes protagonists of Jiggs and Lyman, it doesn't necessarily celebrate them. Perhaps they have the constitution behind them, but in some ways they can't claim moral superiority to Scott. The General is a threat, but he isn't a monster either. Made during the Cuban missile crisis, many Americans agreed with General Scott's belief in a strong military offensive. Frankenheimer didn't, but he wanted to portray Lancaster's character as sane and level-headed. Frankenheimer recorded commentary for the film, included in this release, in which says that he doesn't believe that this movie could be made today, because he doesn't think audiences would accept a president with the morals of March's Lyman. He believes the office has been debased. I don't know when he made those comments, but it is worth noting that this feeling about the highest office in the land has existed in varying degrees of passion since Kennedy's assassination. Due to political tensions at the time, co-producer Kirk Douglas recalled getting pushback from several directions when he wanted to film the story. It was only when President Kennedy not only gave his approval, but encouraged the producers to continue that the production could continue. JFK had had his own experiences with a dangerously influential general and seemed to want the public to understand how fragile democracy can be. Here that fragility is revealed quietly, behind doors, coming to the edge of crumbling without a hint to the public. In some ways it is insidiously subtle; Jiggs knows the threat is real, but in fighting to be heard, you sense his self-doubt. It isn't so much that he doesn't believe in his end goal, but rather that the forces against him are so relentless that he struggles to keep his focus and moral grounding. While these major players drive the action, they make victims of their foot soldiers. The emotionally exhausted Holbrook is already down when Jiggs further betrays her trust. In their quest for truth presidential advisor Paul Girard (Martin Balsam) and Senator Raymond Clark (Edmond O'Brien) become casualties of their own patriotism. It is a trio of moving performances, all of them pawns in different ways. March and Lancaster communicate their entitlement smoothly.Their characters are more alike than they'd care to admit, both of them in power because of their ability to ask for sacrifice and their ferocity in standing by their beliefs. It was interesting to see two actors with such bold personas playing low-key roles. Still, though they are more subtle, but you can see the confidence surging beneath the surface. 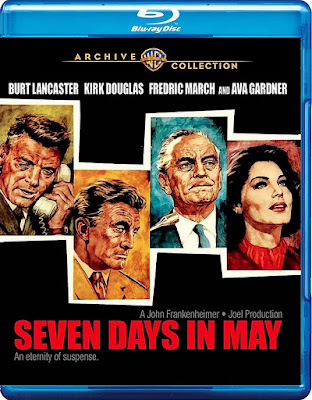 A fascinating commentary by John Frankenheimer is the sole Special Feature on the Blu-ray.